Security and control are closely related within records management, and it is easy to have issues that revolve around security be considered control, and vice versa. With regards to your records, control is more than just making sure your records are secure. Control means knowing your records are being managed. 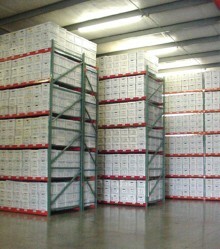 Your records are bar code labeled, scanned, and recorded into our system. With Records Management Services, your inactive records are managed, giving you control over your records that you simply do not have if your records are stored at your location or in a storage unit. With Records Management Services, you get peace of mind. ** "Why Records Management" from Professional Records & Information Services Management (PRISMS) International, a not-for-profit trace association providing education, networking, and advocacy services to their members and the business public.